Another great way to search for home is by zip code. Albuquerque has 16 different zip codes which you can search using the links in the sidebar to the right or by using the advanced Albuquerque MLS search form. If you're not familiar with the city, the summary of top selling, most expensive and most affordable zip codes below should help you begin to get more familiar. The top selling zip codes in Albuquerque as determined by the total number of sales are 87114, 87120, 87121, 87111 and 87110. 87114 is located in the far northwestern corner of the city near Rio Rancho NM. This zip code is popular with people who are looking for larger and newer homes and is especially popular with people relocating to Albuquerque. The majority of the homes in this zip code were built after 1995. New construction continues in the area of Ventana Ranch at Montecito Estates. The average sales price was about $198,000. Browse 87114 homes. 87120 is also located on the west side of Albuquerque, further south than 87114, but north of I40. Taylor Ranch is a popular neighborhood in this zip code. Older than 87114, the homes that sold in 2013 averaged $190,000. Browse 87120 homes. Located in southwest Albuquerque, not only is 87121 a top selling zip code, it's one of the least expensive ones too. The average sales price was only $112,000. 87111 is located in northeast Albuquerque and includes popular neighborhoods like High Desert and Tanoan. The average sales price was approximately $288,467 last year. 87110 includes the Albuquerque Uptown neighborhood, as well as parts of the UNM and Fairgrounds MLS areas. The most expensive zip code in Albuquerque is 87122 which covers Sandia Heights, North Albuquerque Acres and Albuquerque Acres West. It's no surprise that this is the most expensive zip code, all three of those areas feature luxury homes on larger lots. Coming in second place is 87104. This zip code covers the Near North Valley, Country Club and Old Town areas near downtown. The near north valley has a wide variety of homes from luxury houses to affordable, older north valley homes. The Albuquerque Country club area has some grand homes as well. Third place goes to the 87111 zip code. Neighborhoods here include Tanoan, High Desert and more. Read more about the most expensive zip codes in Albuquerque. The most affordable zip codes in Albuquerque are 87121, 87105, and 87102. is the 87121 zip code located in SW Albuquerque. The majority of the homes in the area are newer. In fact, there is some new home construction in the neighborhood today. The downside to buying in this area is that it's also the zip code with the most short sales and foreclosures. 87102 is the third most affordable zip code. This area includes downtown Albuquerque and the east downtown area sometimes called eDo. 87121 has the most short sales and foreclosures. Over 50% of the closed home sales in a given month may be distressed. Why? Too many homes were built too quickly, were marketed too aggressively and back in the days before the mortgage crisis were sold to some home buyers who really shouldn't have qualified for home loans. 87105 in Albuquerque's south valley comes in second with 41% of home sales coming from short sales and foreclosures. 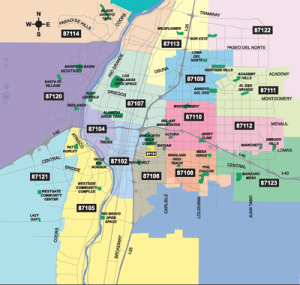 87114, also one of the most popular zip codes, came in at 25%, followed by 87102 (affordable Downtown area), and 87120 in Northwest Albuquerque.